This poster of Samuel Clemens can really tie a room together. You know you want one. 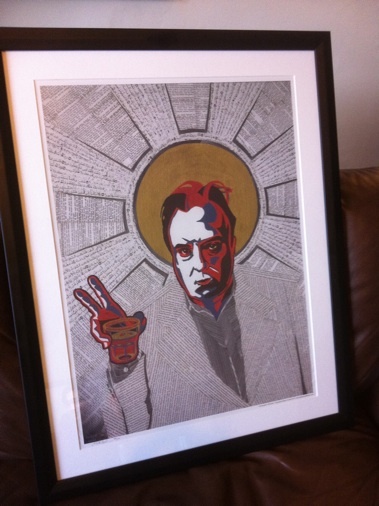 So far I’ve shipped about 70 Hitchens posters to 6 countries around the world. 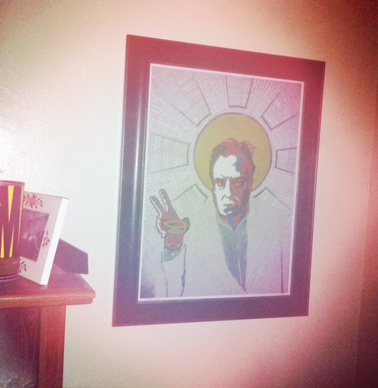 I’ve received several photos of Happy Customers‘ Hitchens posters hanging proudly in their homes and offices. Some of you decked him out in some classy frames and matting. To you patrons of the arts, thank you so much for buying my prints. Here’s a sample of some of the pictures, to view them all click here. 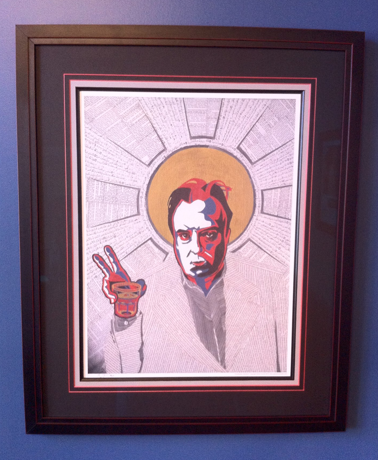 To order a Hitchens poster, click here. 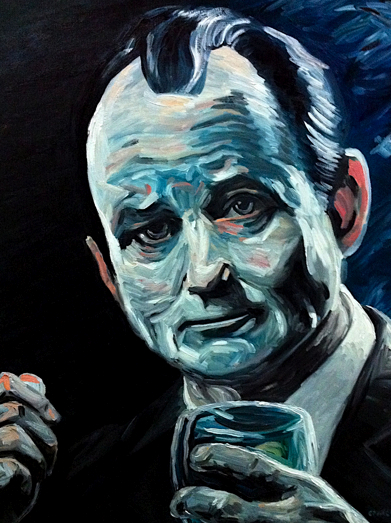 “For relaxing times, make it Suntory times”. Lots of new art products up for sale on Zazzle. 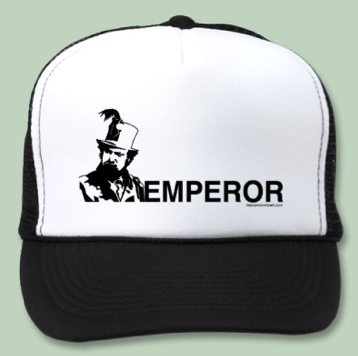 What do Thomas Paine, Mark Twain, Emile Zola, and Emperor Norton have in common with coffee mugs, hats, buttons, t-shirts, and iPhone cases? They are all available at my Zazzle.com store! Mission Dolores Park Prints are Here! The prints came out great! To purchase (at an insanely reasonable price of $15), please visit either the shop over at AdrianCovertWeb.com or the friendly folks at Faye’s Video and Espresso Bar on 18th street between Guerrero and Dolores Streets. 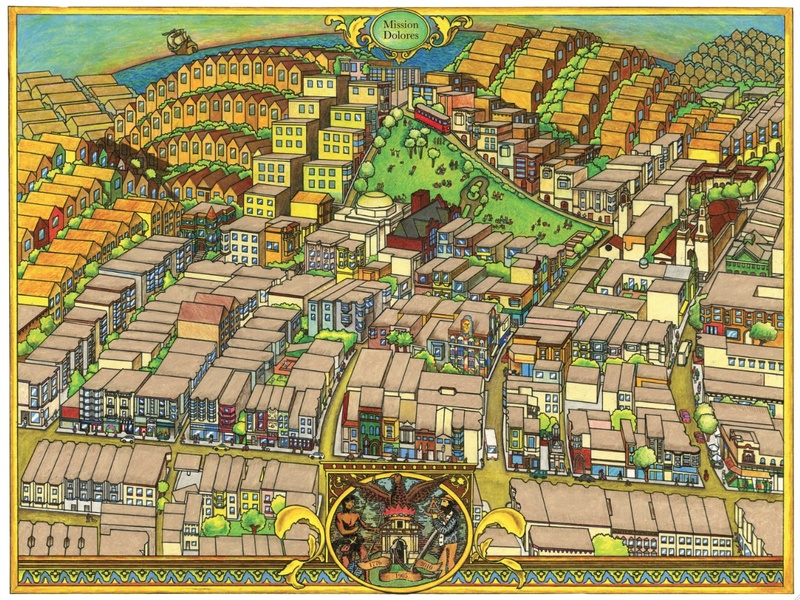 An illustrated view of Valencia Street and Dolores Park between 16th and 21st street. 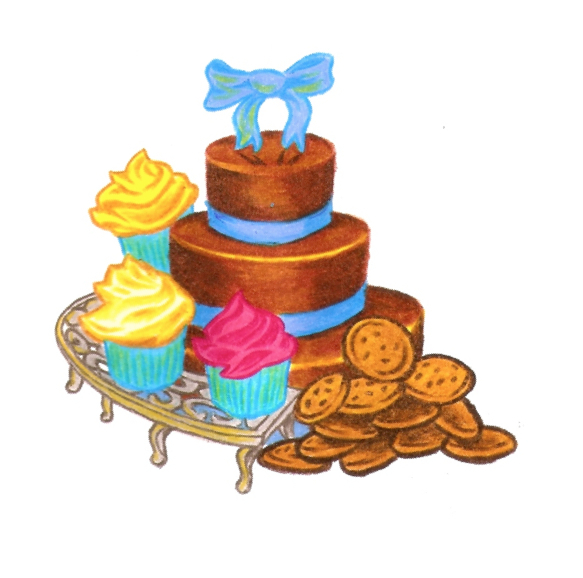 This is for a friend’s currently ‘in-the-works’ bakeshop. “Jules Verne” 2011 (Appropriation of J. Chase). Acrylic and Marker on Canvas. 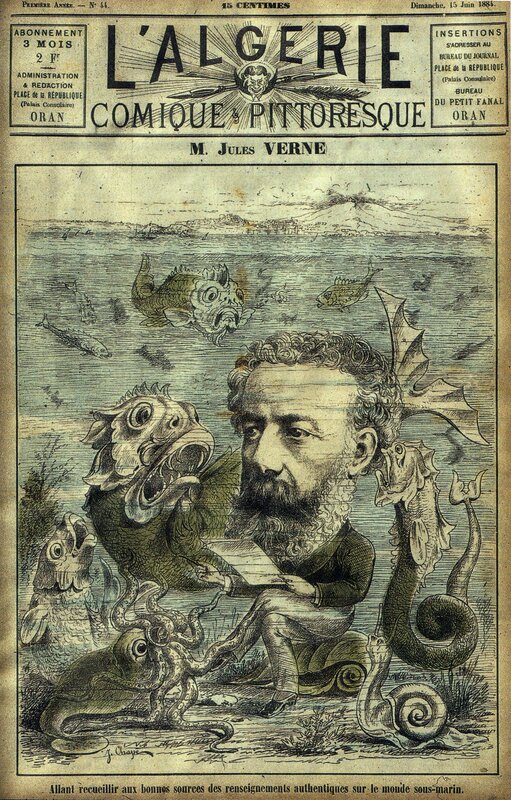 Jules Verne is sometimes considered the father of science fiction. As such, I figured he would make an excellent addition to my recent catalog of writer portraits. 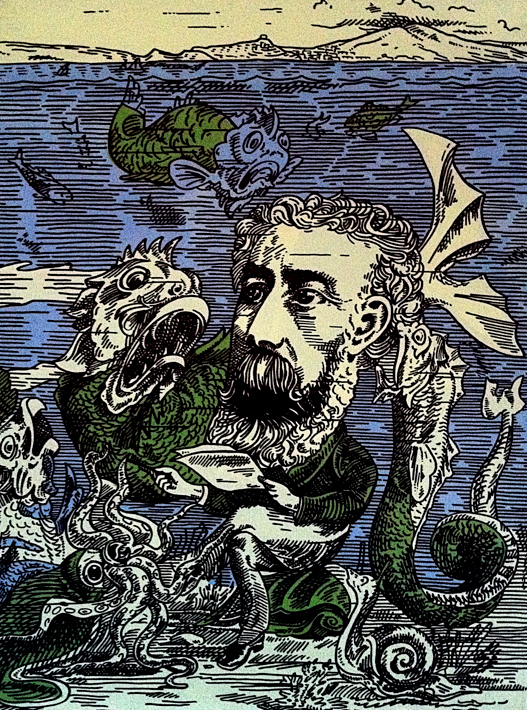 In researching Verne’s likeness, I came across a beautiful print apparently from a 19th century Algerian comic/short story magazine, “L’Algerie”. The image is signed by the artist “J. Chape”. I thought it would be fun to do a large replica, so I set out an 18×24″ canvas with acrylic paint and recreated the woodcut-look with a thick sharpie and a free hand. 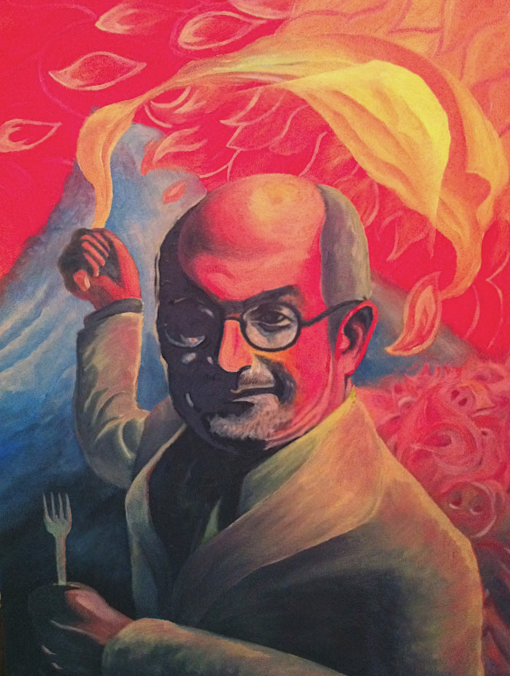 Salman Rushdie (2011). Oil on Canvass. Note: I apologize for the low-resolution picture, which omits detail (especially the sky). Until I get it scanned, my cell phone camera will have to do. Salman Rushdie‘s novels breathlessly intertwine historical narrative with the fantastic, a style that has been described as ‘Magical Realism’. As such, depicting him has given me good excuse to get reacquainted with those bolder regions of the spectrum. The fire, hailing from a mid-air explosion, as well as Mount Everest and the enthusiastic consumption of pork, are all references to scenes in the novel The Satanic Verses, while the perforated sheet flying overhead appears several times throughout the novel Midnight’s Children. I’m considering making 18’x24′ poster prints and selling them on my website, adriancovertweb.com, most likely for $30-$40. Please let me know in the comments section below if you’d be interested in ordering one should they become available. Thank you!